Nine’s Carols by Candelight leaned heavily on The Voice with considerable success last night, but again shunned audience favourite Humphrey B. 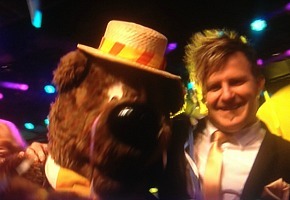 Bear and came off worse for wear with his replacement act, Kids WB. The Voice winner Harrison Craig opened the show, duetting with Silvie Paldino, before Rachael Leahcar channelled Mariah Carey with All I Want for Christmas. I’m not so sure the song, and those bottom notes, really suited her. But things got decidely worse with Kids WB and the Warner’s Bros characters in a poorly produced segment from Showtime Productions. A bizarrely-shaped Santa -no longer performed by Terry Gill as it has been for longer than I can remember- looked like he had swallowed a giant pudding yet none of it had reached his slim hips. A “Halla-Looney” chorus risked riling the religious. Ditch the sponsors, please come back Terry Gill, Hi-5 and Humphrey. Thank goodness for Denis Walter bringing some tradition and class with O Come All Ye Faithful. The night began to improve with Erin Holland and Christie Whelan-Browne. A cheerful Tim Campbell -no sour grapes after Nine dumped him from House Husbands– got the Bowl on its feet with a medley led by Santa Claus is Comin’ to Town (newsflash: he’d actually just appeared). Campbell’s backing vocalists were some of the best in the biz and worked throughout the show. Campbell’s partner Anthony Callea, chalking up his 10th appearance, is always note perfect, if overtly shiny. Callea is pure showmanship when left to singing. Veteran soul man Steve Clisby crooned through classic American Christmas songs with ease, backed by the dependable Melbourne Gospel Choir (a shout out to the versatile Lucy Holmes). Clisby almost left fellow Voice graduate Darren Percival nowhere to go, but never say never, he had the Bowl swinging. Harpist and singer Alana Conway delivered a sublime Silent Night. Silvie Paladino gave the performance of the night with her exquisite vocals. Why do we not see more of this remarkable performer on Australian television? Hugh Sheridan, in his first appearance, channelled American jazz but managed to show off his musical side. Host David Campbell reminded us he is his father’s son, almost shouting his way through his ‘spontaneous’ song. Campbell was the second performer of the night who has performed the great J O’K during his career and there were shades of it tonight. Audience favourite Marina Prior made her 22nd appearance and never disappoints. But Twitter was awfully distracted by her face. The Voice‘s Luke Kennedy turned O Holy Night into popera -until the final night note got the better of him. He was doing so well until then. Winner Harrison Craig seems to sing every song the same. White Christmas was the blandest song of the night and I wonder how long his career can be sustained on a repertoire of ballads…? Tenor David Hobson, joined by boy soprano Beau Woodbridge (son of Todd), sang well before the line of the night about “cross-pollinating.” He redeemed himself with his annual rendition of the stirring The Holy City –and remembered the lyrics this year. The finale with the full cast for We Wish You a Merry Christmas included a brief glimpse of Humphrey B. Bear who had clearly been on pre-show duties for the audience at the Bowl. It’s high time Nine put him back in the show and let some of the sponsor-produced ring-ins witness the meaning of audience popularity. #carolsbycandlelight humphrey didn’t forget us! There were also in-show plugs for Myer, Les Miserables, and upcoming Nine shows in the commercial breaks. Lisa Wilkinson demonstrated she didn’t need larrikin Karl Stefanovic to get the job done, all with one outfit for the night. Congrats to nice guy John “cymbals” Foreman, Doug Heywood, orchestra and choirs for three hours of being the backbone of the show. Nine’s production team also did them proud, capturing the size, spirit and diversity of an iconic community event, Live to air. If you missed it all or just want to relive it all again (you’d have to be keen), Nine repeats it at 1pm today.